The entire town is mixed with old and new. The old is beautifully kept and in amazing condition. I walked up and down the streets visiting small shops but spent most of my time photographing the beautiful architecture. I had lunch at a small diner named simple Simmons. The black bean vegetarian soup with corn bread was good plus filling. The Mission Inn proved to be an amazing place to visit and photograph. The structure Is in amazing condition and has been modified over the years to accommodate being a hotel. It has a spa and multiple indoor and outdoor restaurants. There is a Spanish outdoor restaurant that could take a lifetime to photograph. There is that much detail. When I was leaving the town, I noticed a flag, cross and lighthouse but could not find how to get to the top. 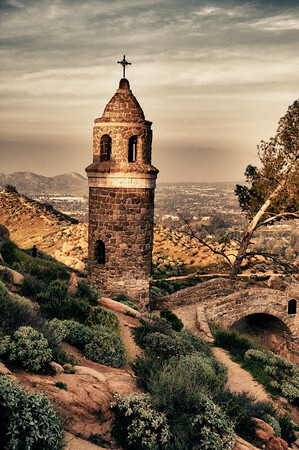 I drove around searching for a way to get to the top of this mountain, weaving between more and more dead end streets. However, there was one common theme; they all directed me to a line of cars along a road in a residential section of town. Then I saw it, a well kept gate with a sign indicating an entrance to a park. I found an open slot along the road and parked the car. Grabbing my camera backpack and water bottle, I hurried out of the car toward the entrance. Not knowing what to expect, I walked up a steep hill to where I saw the gate and noticed many different types of people. Young, old, with children in strollers, runners, walkers, and people on bicycles and was amazed how many were starting up the well maintained trail. After a few hundred feet, I realized this path wound around the mountain and took me to my hopeful destination. Never in my wildest dream did I believe it would be so much fun to take this journey. The view was breathtaking as the path circled around the mountain to the top. I was able to look down on Riverside and as the path went around toward the west side of the mountain, I was able to look upon the river basin and interstate. Keeping a quick pace (not realizing how long the walk was up this mountain), I began to tire and started to realize that when I reached the top, I needed to duplicate the trip down the mountain. However, regardless of how I felt, I kept moving. As stated, there were all types of folks walking and running up the mountain. I began to ask questions to other walkers about the mountain and they told me that it is a very popular place all day long. (I can understand why too.) Approximately one third of the way up the mountain, I began to take side journeys over the very large rocks to explore the view from a different perspective. Although there were no guide or guard rails and any wrong step would send me down hundreds of feet, I wasn’t scared. It was a very different feeling. Something that only can be felt to fully understand and words will not fully explain. After overlooking the town for a few minutes I was back on the trail and up toward my destination. When I was nearly half way up the mountain, the anticipation increased my energy and I began to walk faster and faster. Passing families with their children in strollers caused me to wonder about the safety of their trip. Since there were no guard rails along the path, one missed step and they were over the side. This thought concerned me every time I walked by them. In fact, I would walk toward the outside (edge) of the path rather than the inside when I passed them. The path is wide enough for a few folks to walk side by side at the same time but it still concerned me. Two thirds up the mountain and I realized that there are three different sections of the top. The highest section is where the cross stands and the lowest is along the top part of the path for the lighthouse. The flag stands alone in pure majestic beauty. 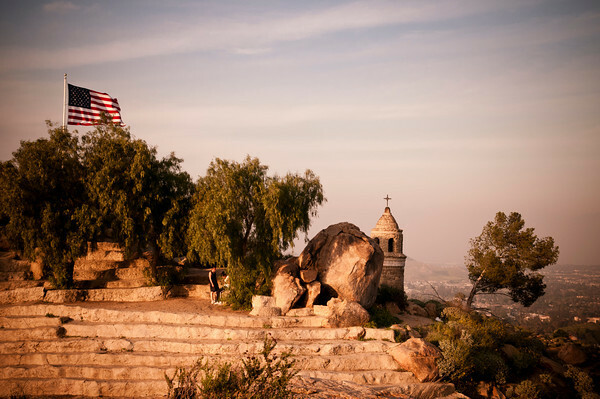 Both the cross and the flag are on top of a section of stone that requires climbing very steep and odd shaped steps to reach the base. However, the journey was definitely worth the effort. I could not believe the view and lack of fear to look over the entire town. From the top, it was possible to view all four directions. To the east was Riverside and to the west was a beautiful sunset that was beginning to take place. At this point, I realized that I should be exhausted since I was up since 0200 when I was getting to leave Pittsburgh for California. Then a wild thought hit me. This is the perfect way to get 27 hours in a day. Travel from the east coast to the west coast. I picked up three extra hours due to the time change. Yes! :-D However, I was not tired. I felt as if I just woke from a restful sleep to find myself looking at the beauty of God all around me. Across the top of the mountain there were at least fifty to one hundred people at all three stations. Some had large dogs, while others had small dogs. There were little children and folks much older than me. I was amazed how many folks were sitting on different ledges looking out and taking in the beauty. On the west side, there was an overlook that had a large wall around it which kept folks from falling over the ledge. This view provided me with a tremendous opportunity for an amazing sunset that I was watching. Not only did I climb the steps to the flag but I journeyed to the other side of the top of the mountain and climbed the stairs to the cross. The sun was setting on it and I could only imagine the different looks it took on with each weather pattern. Today, it stood glowing in the beautiful sunset. The first image was taken from the side of the mountain near the flag. I could have stood there and photographed this section for hours. However, the sun was setting and I wanted to ensure I made my way down the mountain before it was too dark since I didn’t have a flash light and wasn’t sure how dark the path was at night. The second photo was taken from near the cross. Tamron 17-50 on the Nikon D300. Awesome Pics!!! Makes me miss home even more!!! This is my Hometown area!!! :( Great Job!!! Thanks for the suggestion to visit the town. I could have spent days photographing it.